If you drive an Audi, you know a thing or two about style and class. These German cars boast impeccable design, though anyone who’s driven one knows that they’re not all about looks. They also feature an incredibly smooth ride, sleek and comfortable interiors, and all the gadgets necessary to make your trip that much better. We’re well aware of all this (and then some) at Joe Davis AutoSport in Perkasie, PA, where we can meet your every need when it comes to repairing your Audi. Thanks to our close relationships with top parts suppliers, we’re able to get exactly what is necessary to fix your Audi, and fast! We are a trusted and reliable alternative to dealerships and our ASE certified technicians can often take care of your needs within a day’s time. Not only that, but our work comes with a 24 month/24,000 mile warranty. If you’d like to drop your vehicle off for service, please ask us about our free shuttle service as well as available loaner cars. 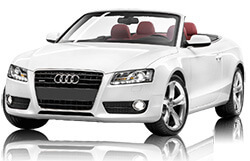 We invite you to call us, schedule service online, or contact us today for all of your Perkasie Audi repair needs.